Hi guys. During ESUG 2011, at the Awards, I was showing Fuel. The week before such event I was thinking what I could show to the people. This was a challenge because showing a serializer can be plain boring. I was working at home that afternoon, and suddenly I thought: “What happens if I try to serialize a living debugger and materialize it in another image?” After 5 minutes, really, you will see it takes only 5 minutes, I notice that such crazy idea was working OUT OF THE BOX. Even if I knew Fuel supported serialization of methods, contexts, closures, classes, etc…I was surprised that it worked from the first try. I was so happy that I tried to explain to my poor wife what I had just done hahahah. Unfortunately, she told me it was too abstract and that understanding the garbage collector was easier (I promise she really understands what the garbage collector does hahhahaha). Well….several months has passed, but I would like to show you how to do it because I think it may be of help for real systems 😉 So…the idea is the following: whenever there is an error, you can get the context from it, and such context is what is usually written down into a log file (in Pharo this is PharoDebug.log). I will show you two things: 1) how to serialize a debugger in one image and materialize it another one and; 2) how to write down the context into a Fuel file when there is an error so that you can materialize it later in another image. ((Smalltalk at: #ConfigurationOfFuel) project version: '1.8-beta1') load. Once you have finished loading Fuel, save the image. Let’s call it Fuel.image. a := 'Hello Smalltalk hackers. The universal answer is '. a := a , '42!'. Then I select the whole code, right click -> “debug it”. Then I do one “step over” and I stop there before the concatenation with ’42!’. newDebugger := FLMaterializer materializeFromFileNamed: 'debugger.fuel'. newDebugger openFullMorphicLabel: 'Materialized debugger ;)'. So???? Did it work?? are you as happy as me when I first saw it? 🙂 if you check this new opened debugger, you will see its state is correct. For example, the instVar ‘a’ has the correct state. 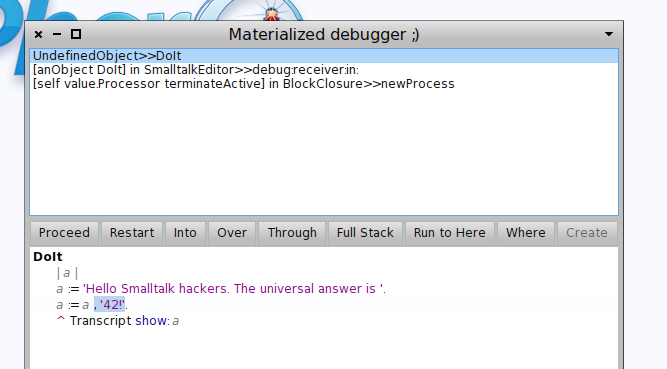 You can now open a Transcript and continue with the debugger as if were the original one. Of course that even if this simple example works, there are a lot of problems. But I will explain them at the end of the post. 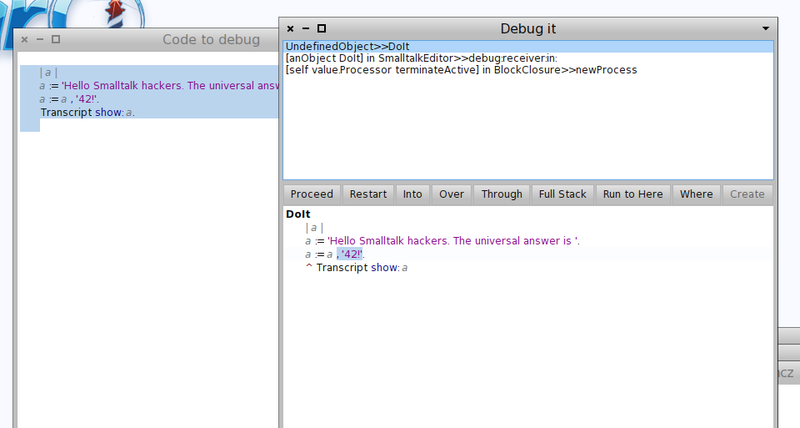 In the previous example we have serialized the debugger manually. But imagine the following: you have a production application running. There is an error, and PharoDebug.log is written with all the stack. The user/client send you by email the .log and you open your favorite text editor to try to understand what happened. Now imagine the following: you have a production application running. There is an error, and a PharoDebug.fuel is written with all the stack. The user/client send you by email the file and you open an image, and then materialize and open a debugger. How does it sound? 🙂 magical?
" we should think about integrating a toothpick here someday"
"wks 9-09 - write some type of separator"
logger nextPutAll: (String new: 60 withAll: $- ); cr; cr. aContext := FLMaterializer materializeFromFileNamed: 'PharoDebug.fuel'. Et voilà! Hopefully that worked 🙂 Notice that in this example and the previous one, there is nothing in special with the Fuel serialization. You are using the normal API, and all you do is to serialize a debugger or a context as if you were serializing any normal object. Of course, you can also apply this idea to other places. For example, in Seaside you have an error handler. You may want to serialize the error with Fuel there. Even if Fuel can fully serialize methods, classes, traits, etc., it is recommended that the image were the contexts/debuggers are serialized and materialized are equal. If you are doing this in a production application, then you can have the same image running locally. The idea is that both images have the same classes and methods installed. This is because, by default, if the object graph to serialize includes compiled methods, classes, class variables, etc., they are all considered as “globals”, which means that we only serialize its global name and then during materialization it is searched in Smalltalk globals. Hence, classes and methods have to be present. Otherwise you have to use Fuel in a way that it serializes classes as well, but that’s more complicated. The graph reachable from the contexts can be very big. For example, Esteban Lorenzano was doing this for an application and one of the problems is that from the context it was reachable the whole UI…which means lots and lots of objects. In such a case, you can always use Fuel hooks to prune the object graph to serialize. This entry was posted on Thursday, January 19th, 2012 at 11:45 pm	and tagged with Debug, Fuel, Pharo and posted in Uncategorized. You can follow any responses to this entry through the RSS 2.0 feed. Smalltalk magic at work indeed! Very promising, and well explained post. Thanks! Thanks Sebastian. Indeed, Smalltalk magic. Imagine that you can not only serialize contexts and closures, but also processes. I haven’t time to go further in the details, but imagine fancy stuff about distributed work by passing arround processes or closures to execute, or remote debugging, or Seaside sessions replications (no need anymore of server afinity), or …. No matter how “imperfect”, this is still infinitely better than being confronted with a “dead” (and often obscure) stack-trace in a log file. More than once on a Java project we wish we could have had access to the “live” stack-trace, examine any stack-frame at will, see the values of parameters, fields, local variables, etc. In projects that deploy stable “staging” releases the stack-trace COULD be opened in a copy of the production image. This would likely save countless of man-hours lost to trying to diagnose the problem in an environment radically different than your developer desk (production vs. development). If Smalltalk was more popular, it would be really interesting to make a study as to where most man-hours get lost: automatic seamless safe refactoring (on which Eclipse would seem to have some kind of edge) or problem diagnosing (where Smalltalk definitely has the edge). Amen. Nice analysis. Indeed, it is an interesting topic. In my case I will contribute by continue building the base infrastructure (Fuel for example). Hopefully could be people in the future that build such funcy stuff. Will you use it on http://code.google.com/p/pharo/ ? Stack traces are hard to use with release code (symbols not always available, ASLR, etc.). Knowing exactly which code path was taken and why is really useful. Mariano, do you know the size of Esteban Lorenzano’s serialization you were talking about? 1) He was doing a DESKTOP application with Glamour. From the context of the error, he could reach his UI/Windows/Browsers objects. For this app, he had A LOT of data inside the image (kind of a small database in memory). And such lot of data was reachable from the UI. Hence…everything was serialized. In this case the file was approx. 7MB. The main problem was not that one but the following. 2) Since the graph to serialize was big (approx. 7MB) it took between 1 and 2 seconds. Problem was that the UI could change during that time. And if the graph changes while Fuel is serializing it…then there will be an error. The solution was pretty easy since we used a hook of Fuel to make transient the root of his “in-memory database” in the UI. The file becomed 500kb and the stack was written instantaniously. I wasn’t aware of airbrakeapp. It looks interesting. The only problem is that it doesn’t look open source, right? I would love something like that for Pharo/Seaside. Thanks for the comment. I would really like to know what is required for a Pharo-based application to use such a tool.